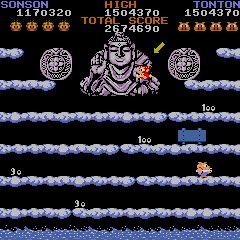 Looking for an arcade game that resembles a side-scrolling Ice Climber in which you control a monkey that hurls fireballs at angry dinner plates? Then look no further! Capcom has seen it fit to release 1984's SonSon from its trove of arcade treasures, and while this isn't likely to be the game anybody was particularly waiting for, it offers a pleasant enough diversion as we wait for the good stuff. 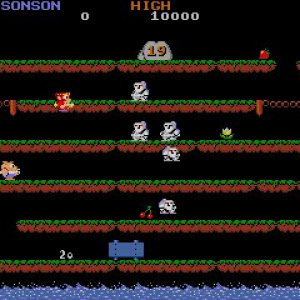 SonSon sees the player controlling a monkey through a series of auto-scrolling areas, battling (or evading) enemies and picking up fruit and other bonuses. The player can move either left or right, and jump up and down from corridor to corridor at will. In order to defend himself, our fearless monkey warrior has the ability to throw fireballs. There are also immediate-use power-ups that will turn all of the enemies on the screen into delicious veggies. Yum! The platforming elements are minor at best, and with the exception of an extremely small number of gaps to watch out for, a player can pretty much stick to a single corridor for the entire game, leaving only to grab a particularly tempting pickup, or to engage in one of the multi-tiered battles that take the place of boss fights at the end of a stage. The game is so simple that it's almost impossible to not know how to play. Everything that can't be shot should be picked up, and everything that can't be picked up should be shot. It's simple, mindless fun, and that's both a good thing and a bad thing. The simplicity of the game means that it's easy to pick up at any point in order to kill a few minutes alone or with a friend, but it also means that the experience isn't likely to be very engaging or memorable. The music is fun and the graphics are passably cute, but neither is enough to keep a serious gamer coming back again and again. Recommending SonSon is a difficult prospect. Certain gamers will relish the chance to have another fun score-attack game in their collection that they can spend time perfecting, but others are likely to see it as a few minutes of charming diversion, and nothing more. A great game will often reward gamers with a more complex or deep playing experience the more time a gamer spends with it, learning its tricks and quirks, and determining how to best account for them. SonSon, however, is decidedly shallow, and while the experience of playing it can indeed be rewarding, it does seem to expect players to meet it more than halfway. This game might not have introduced many unique elements to the world of arcade gaming, but it at least used established conventions in an interesting and enjoyable way. 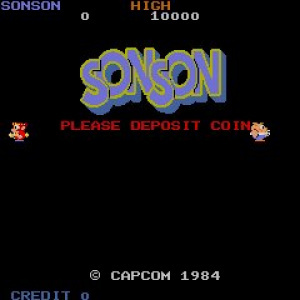 SonSon's simplicity manages to be its greatest strength, and also one of its major drawbacks. It might not be a download that you turn to often, but it can provide a few minutes of mindless fun whenever you do decide to play it. I personally dislike SonSon. Too hard and a bit cheap, at least from my experience. Good review, Brutus. 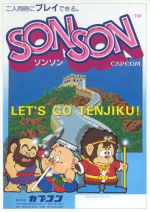 SonSon is all right, not great, but decent. Pirate Ship Higemaru, which came out in the same year, is way better, imo. that's disappointing. I was hoping for my first possible VCA purchase. Yeah, I liked Higemaru more, too. Too bad it's not coming to VCA any time soon, though. 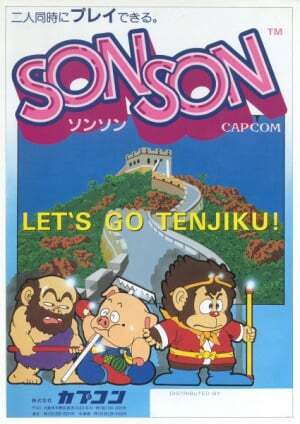 I played the Famicom version of this, decent game, not great though. I want Son Son II for PC-Engine on VC. I wonder why they still haven't released it yet. @Ω - this game had a sequel? I never knew that until you mentioned it just now. 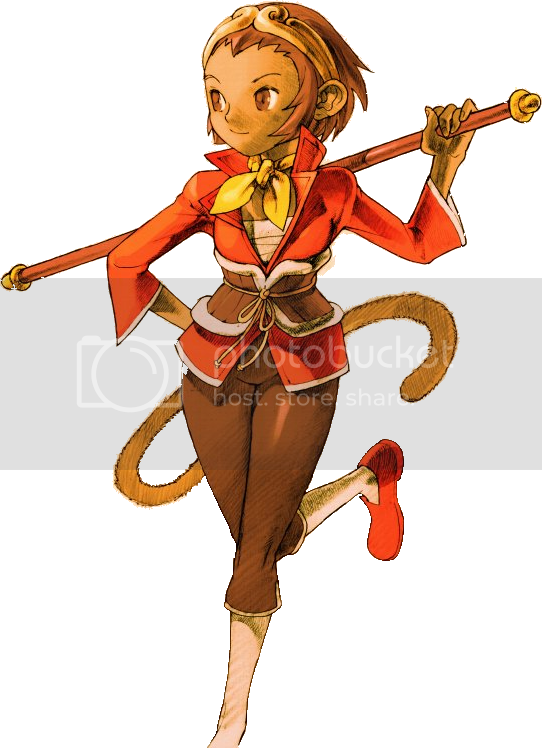 @JumpMad - the character's picture you've shown looks a little like Char from Breath of Fire II: The Fated Child (also from the same company). @StarBoy: Yes, but it was only released in Japan, maybe this is why you've never heard of it. I think it's a pretty good game. I hope it comes as import game to the VC. @Ω - not bad. Looks good. I think the NES game should still come to the Virtual Console. Even at 600 points, it would still be cheaper than this arcade version. A more appropriate price point I should think. Outside of the game itself, what are the special arcade features for customizing the game? No freaking way this game's worth 8$, the capcom collection 2 was like 20$.